Australia hosted a stop on the Individual Apparatus World Cup circuit for both men and women, after 12 long years. Gymnasts from eight different countries competed against each other at the Hisense Arena in Melbourne, Australia at the last night of the World Cup Gymnastics on Sunday, February 24. Gymnasts from 13 nations went head to head over two days of qualifying rounds. The best eight of the 13 competitors on each apparatus qualified to compete for the prestigious gold medal on the final night of the event. The finals in men’s parallel bars, vault, horizontal bar, balance beam and women’s Floor stunned the crowd. The first apparatus in the finals was the men’s vault, which turned out to be a close one. Igor Radivilov of Ukraine turned out with two incredible vaults with a score of 14.949 which guaranteed him the gold medal and set him at the top spot. Loris Frasca of France grabbed the second position with a score of 14.900 and earned himself a Silver medal. Dominick Cunningham finished off the podium in the third position with a score of 14.749 and took a bronze medal to his homeland, Great Britain. Georgia-Rose Brown of Australia claimed the first medal of the Gymnastics World Cup 2019 for Australia with a score of 13.336 on uneven bars on the first day. She received the bronze medal. Previously, Brown helped the Australia win a silver medal in 2014 at the Commonwealth Games in Glasgow and also represented Australia at the 2012 Summer Olympics in London. 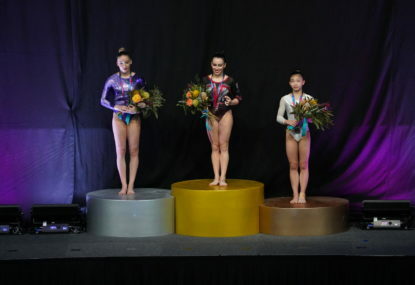 The second position was held by Jiaqi Lyu of China with a score of 14.366 whereas, claiming the top place on the podium and the World Cup 2019 gold medal was another Chinese athlete, Yilin Fann with a score of 14.833. On the next day, Sunday, the stage was all set for the finals. This event gave the 2014 World Artistic Gymnastics Championships participant and esteemed Australian artistic gymnast, Emma Nedov the chance to proceed with her outstanding performance on her home soil. She had previously won the 2013 Australian National Champion and received a gold medal for her performance. The next competition of the night was the balance beam, with two Australians in the blend for the medal conflict. The competition was close between first and the second; China’s Shiting Zhao grabbed the top spot and scored 13.566 to claim the Gold medal. Emma Nedov from Australia came second and grabbed the silver medal with a score of 13.500. Mana Oguchi of Japan earned herself a bronze medal with a score was 13.066. This captivating parallel bar competition led to an incredible match later on. Hao You from China, played out a fantastic routine; she won the Gold medal scoring 15.066 points. Turkey’s Ahmet Onder scored 14.633 and earned a silver medal while Ferhat Arican of the same team, won a Bronze medal at a score of 14.366. The gold medals were awarded to the two powerhouses; Japan’s Hidetaka Miyachi with a score of 14.733 and Epke Zonderland of the Netherlands who hit the same score. However, Miyachi claimed the top spot at the podium with the Gold because of higher execution, and Zonderland received the Silver medal while Chenglong Zhang of China received a bronze with a score of 14.333. The last mechanical assembly through the afternoon and the entire challenge was Women’s Floor, Melbourne was sufficiently fortunate to stamp the arrival of Vanessa Ferrari from Italy in the wake of harming her Achilles in 2017. Ferrari performed well to win the Gold award easily with a score of 13.600. Puerto Rican Paula Mejias sparkled before the crowd of Melbourne and scored 12.533 to get a Silver medal. Shiting Zhao of China earned herself yet another world Cup award and got a bronze medal with a score of 12.266. The next cycle of the completion will take place from November 2019 to March 2020. The best finisher from each nation will then fit the bill to compete at the 2020 Olympics in Tokyo if a contender has effectively qualified. The Australian team performed very well at home and looks forward to taking a spot at the upcoming event in Tokyo 2020 championship.